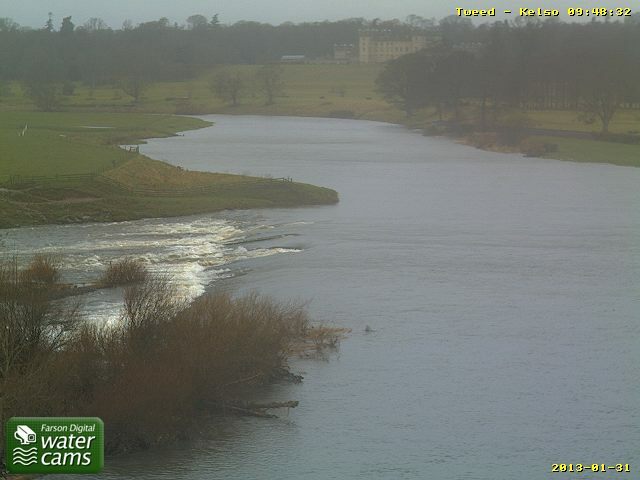 Salmon season starts tomorrow and whilst we have a falling river this morning, there is a Met Office Warning of rain and Gales for today with better to come from this afternoon and tomorrow. Hoping that the frost tonight will drop it in and we can fish. Cloudy with outbreaks of rain. Gales. Generally cloudy with outbreaks of rain and hill snow at first. Further rain and hill snow for Lothian and Borders this afternoon with winds increasing to gale force particularly through the M8 corridor. Maximum temperature 6 °C. Any remaining rain or hill snow over east Lothian soon clearing, leaving a dry night with a frost developing. The coldest spots are likely to be around Moffat and Selkirk. Minimum temperature 0 °C. Light but cold northeasterly breeze. Maximum temperature 5 °C. This entry was posted in Uncategorized and tagged nature, salmon season, weather. Bookmark the permalink.